No-nonsense AV with highly rated protection and performance. 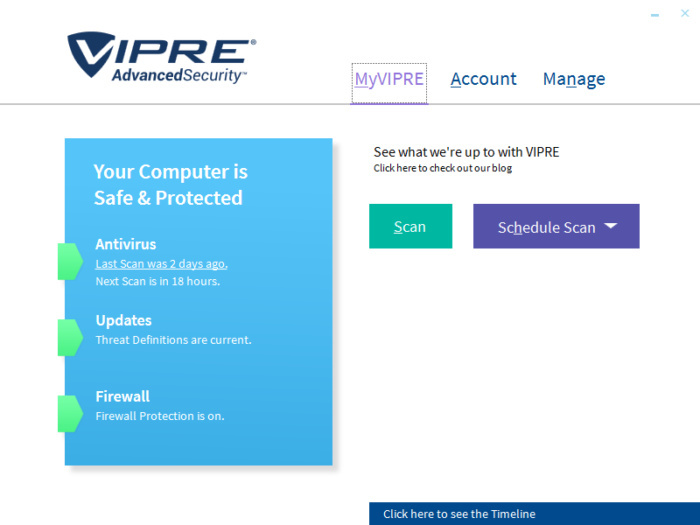 I thought I knew simplified when it came to antivirus, but then I saw Vipre Advanced Security. Created by a top-rated security company, VAS offers a stripped-down security suite for home users. That’s not to say VAS skimps on protection, and there are even a few extras despite its simplistic interface. But Vipre is focused primarily on securing your PC. In a very real sense it’s like the old-school security suites of the ’90s: Protect your PC, everything else is noise. Vipre Advanced Security’s status dashboard. When you first open up VAS you get a basic dashboard with three tabs at the top: MyVIPRE, Account, and Manage. From there you can see the current status of your PC in terms of antivirus, threat definitions, and firewall. Then there are two primary options: to run a scan or schedule a scan. At the bottom of the window there’s also an option to see Vipre’s event history—scans, detections, threat definition updates, and so on. At this point it’s not that different from other security suites. The difference is that in other suites there would be other nooks and crannies of the service to the dive into, but not so with Vipre. VAS is here to scan your PC for the bad stuff, and that’s it. You will find some additional options, however, if you dive into the Manage section. This section is broken down further into five different categories: Antivirus, Updates, Email, Firewall, and Privacy. Vipre Advanced Security Antivirus settings. Antivirus includes a virus quarantine section, and some advanced protection options, some of which are on by default, such as the ability for Vipre to block potentially malicious processes. One notable option that some users might like is Quiet mode, which means Vipre will just take care of threats without notifying you. Updates has only one notable option, which is Vipre’s cloud-based ThreatNet. Like most antivirus solutions, Vipre has a cloud component that uploads threats to its network in order to gather as much information as possible about the current threats users are confronting. VAS scans ports used by your mail client for potential malware. 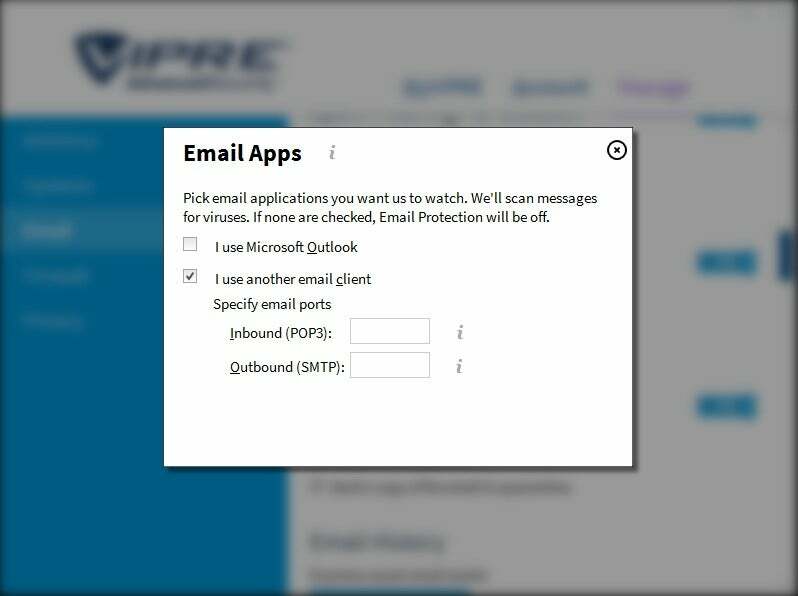 Email offers options for filtering mail in Outlook for desktop, or for scanning specific ports for other mail clients such as Thunderbird. There’s also an antiphishing component. All of these options are on by default, though if you use a desktop app that isn’t Outlook you will probably want to customize the incoming and outgoing port scans. Vipre’s Firewall settings let you manage rules for which apps are allowed outbound and inbound communication. There’s also an intrusion detection system, which is off by default. This allows you to set rules for in-network intrusions base on high, medium, and low priorities. There’s also an option to allow Vipre to monitor and learn about your network traffic to better customize firewall rules. That does require a lot of notifications and interactions with Vipre until everything is figured out. To use VAS’s Social Watch feature you need to log in to your Facebook account. Finally, the Privacy section has a particularly interesting feature called “Social Watch” that scans your Facebook timeline at set intervals, such as hourly, every two hours, every four hours, once daily, or twice daily. 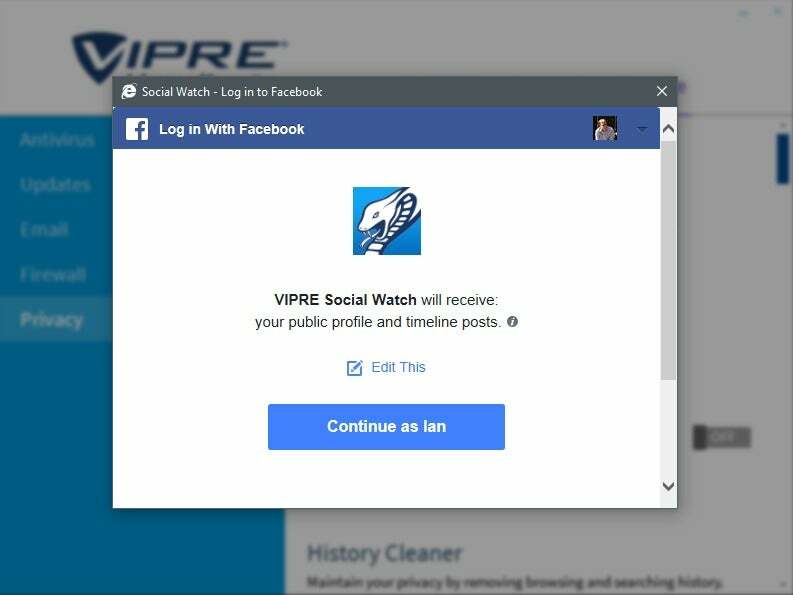 To do this you’ll need to authorize Vipre to access your Facebook account. There’s also a “Secure File Eraser” feature that is known as a file shredder in other security suites. It erases all traces of a file so it’s more securely erased. The privacy section also has a history cleaner that can remove your browsing and search history from most browsers. That is pretty much all there is to Vipre, at least for now. The company tells me that in the latter half of 2018 it will unveil a cloud component similar to VipreCloud for small businesses. This will add parental controls as well as the ability to manage Vipre on multiple PCs in the home. One notable security option missing from Vipre right now is a more robust network scanner to better address the growing smart home trend. This is becoming a standard feature in suites such as Bullguard and ESET. Vipre already has its Intrusion Detection System under Manage > Firewall, and the company says it’s investing in smart home security. So look for more on this front from Vipre in the future. Taking a look at AV-Test’s most recent scores for Vipre’s performance reveals that the security suite did very well. In April 2018, VAS scored 100 percent against zero-day, web, and email threats. In the standard malware test, which uses nearly 6,000 samples, Vipre scored 100 percent. Over at A-V Comparatives, Vipre also scored high. In the organization’s real-world protection test published in April 2018, Vipre blocked 99.1 percent of 224 test cases with one false alarm. In the A-V Comparatives malware protection test that included more than 20,000 samples, Vipre scored 99.6 percent with five false alarms and nine compromises. Vipre Advanced Security’s custom scanning options. For our in-house performance tests we once again had some interesting results. This was our second test on the test PC post-Meltdown patch with no update applied yet for Spectre. Before Vipre was installed our test PC scored 2,465 on PCMark 8’s Work Conventional test. After Vipre was installed and ran a full disk scan that score went up to 2,490. That’s a smallish bump, which suggests our PC shouldn’t see a performance hit from Vipre Advanced Security. As for the Handbrake test, our test PC usually converts a 3.8GB video file to the program’s Android tablet preset in one hour, 15 minutes, and 30 seconds. After running a full disk scan with Vipre, that time went up slightly to one hour, 19 minutes, and nine seconds. That’s probably not going to be noticeable for most home users, but it does suggest you might see a performance dip under the most extreme loads. 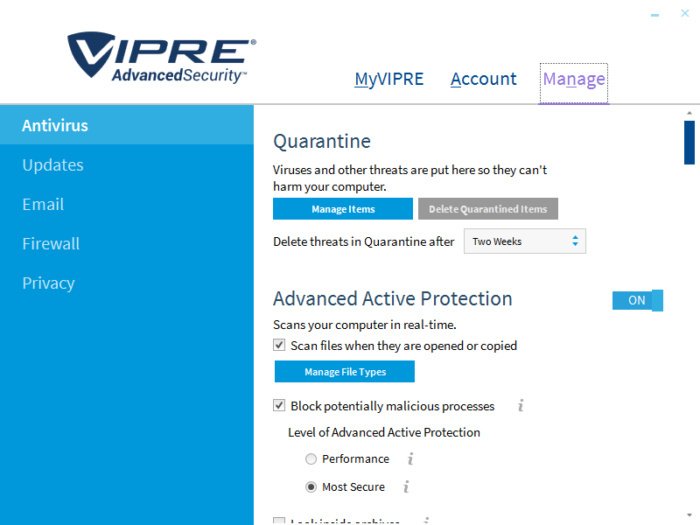 Vipre Advanced Security is a very capable, no-nonsense security suite. After reviewing so many security suites that are overloaded with features it’s refreshing to see a simpler choice for home users. The regular price for VAS is $55, and the licensing costs go up from there, but not astronomically high, topping out at $100 for 10 devices. That pricing is in line with other top security suites including BitDefender Total Security, McAfee Total Protection, and Norton Security Premium. If you’re big on added features such as password managers and secure file backups then Vipre Advanced Security probably isn’t your best choice. If, however, you just want top-rated security for a fair price without a lot of frills then Vipre is one to look at.